I had been looking forward to this gig for months. It is 40 years since Family last performed together and since I last saw them on their farewell tour at Newcastle City Hall in 1973. Marie decided a few days ago that she would like to come along with me, and I managed to buy a ticket for her, so we were all set for a nostalgic weekend. The last time she saw Family was probably 1969 or 1970 at Sunderland Locarno. We travelled down to London by train on Saturday morning, met up with David for a meal, and then took the tube across to Shepherd’s Bush. We had a couple of drinks in the pub next door, and went into the Empire at 8.45pm. Family were on stage prompt at the advertised time of 9.15pm. We had standing tickets down in the stalls and by the time we got into the venue the place was absolutely packed to the walls. I bought a programme and we found a spot on a little raised area at the back of the hall, where we had a good view of the stage. The line-up for the two reunion concerts featured Roger Chapman on vocals, Poli Palmer on vibraphone, Jim Cregan on guitar and Rob Townsend of drums. The members of Family changed quite a but during their career and last night’s grouping represented a pretty good selection of past members. The one big miss was of course Charlie Whitney. I assumed that this was because of some long term fall out between old friends Chapman and Whitney, but the programme says otherwise. Apparently Whitney was the first person that Roger Chapman approached when the idea of a reunion came up, but Charlie now lives in Greece, hasn’t been involved in music for some time, and just didn’t feel as if he could do it. Shame. Never the less the show did go on, and the band was augmented by a number of other musicians to ensure the strange textures of the old classic songs were recreated on stage. There were 9 musicians in total on stage at Shepherd’s Bush Empire last night. As well as the four members of Family there was Geoff Whitehorn on guitar, Nick Payne on sax, flute and mouth harp, Gary Twigg on bass, Paul Hirsch on keyboards and John Lingwood on drums. The programme refers to the additional musicians as the “in laws” and they are all members of Roger’s band. The band were introduced onto the stage by long time friend and local Leicester football hero, Frank Worthington. The set was drawn from across their 8 album catalogue with all the classics and a few lesser know (at least to me) tracks. 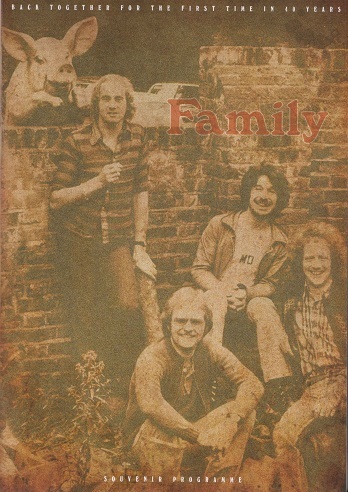 Family music was always a strange mix and difficult to categorise, blending folk, rock, psych, and blues with a deep sense of dynamics, shifting effortlessly from the soft and melodic to loud, rocky and swirling progrock or R&B. The opening song was Top of the Hill, followed by Drowned in Wine. My favourite No Mules Fool came half way through the set. As we got to the end the classics were rolled out to the delight of the largely male, balding late 50s and 60 something crowd. The last couple of songs were the rocky Burlesque, and In My Own Time. For the encore they played an exquisite version of The Weavers Answer, and then we all sang along to My Friend The Sun. Roger was as engaging as ever, a mix of the wild rock singer, the cheeky arrogant front man, and still getting lost in some weird crazy dancing at times. His voice was strong, but has lost a little of its power and the warbling vibrato is perhaps not quite as evident. But hey the guy is 70 and he gave it his all and put in an amazing performance. His crack with the crowd was as cheeky and friendly as ever, like he was with a group of old friends, which of course he was. Time and age haven’t dimmed his humour or his ability to eff and blind with the best of the them. He also made a few quips about effing Whitney sunning himself in Greece, clearly missing his old friend. At the end Roger thanked us and assured us that this was to be the last effing time we would see Family. We all rolled out into the cold night, warm in the knowledge that we had just spent a night with some old friends, and a good night it was too. Marie enjoyed it and recognised the well known songs. Next reunion gig for me is the Status Quo Frantic Four gigs next month. There are some good things about getting old and revisiting your past. Setlist: Top of the Hill; Drowned in Wine; Holding the Compass; Part of the Load; Ready to Go; Crinkly Grin; Burning Bridges; No Mule’s Fool; Sat’dy Barfly; Between Blue and Me; Hung Up Down; Burlesque; In My Own Time. Encore 1: Weaver’s Answer. Encore 2: My Friend the Sun; Sweet Desiree. Family were a great favourite with rock fans in the North East of England. They came up here a lot in the late 60s and early 70s, playing Sunderland Bay Hotel, Newcastle Mayfair, Sunderland Locarno and other local venues. As I posted yesterday when writing about Roger Chapman, back in those days, if you asked anyone in the North East their favourite live band, my guess is that they would choose a band like Family who regularly played in local ballrooms and put on a great live show. In Sunderland the answer would have been Free, Family, and possibly Stray or Edgar Broughton. The first time I got to see Family was at Newcastle Mayfair in June 1972. I have very vague memories of them playing a gig at Silksworth Youth club in the late 60s, and standing outside listening, as I was too young to get in. The gig definitely happened, but my standing outside may well be a figment of my imagination. Thanks to Barry for his memories of the Silksworth Youth Club gig: “A couple of vague memories. Roger Chapman was wearing bright red trousers. When the group had a break a girl asked Chapman if they did any “Soul” music. No, was Rogers brusque reply. If I remember correctly the leader of the new youth club was a guy called Clive. He wanted to put Silksworth Youth Club on the map as music venue. Happy days..”. Family played at the City Hall in 1971, with support from America. Some of my mates went to that gig, but I chose (wisely methinks in hindsight) to see Led Zeppelin at Sunderland Locarno that night. Back to that gig in 1973. I queued outside the Mayfair to get in early and get a good spot in front of the stage. Support came from Audience, featuring Howard Werth who, like Roger Chapman, has his own vocal and musical style. Their album, “House on the Hill” is a classic of the period. Listen to the track “You’re Not Smiling” and you’ll see what I mean. Family were great that night. Roger Chapman sang in his usual unique style, with lots of vocal and mike stand gymnastics; but what really struck my was the way that he engaged, and interacted with the audience. It was like he was meeting a group of old mates. Most of the crowd had clearly seen the band before, and there seemed to be some private joke between Roger and some of the crowd, starting with the crowd asking “What about the workers, Roger?”. The other thing, that sticks in my memory is Poli Palmer’s vibraphone; I hadn’t seen or heard anything like it before. By the following year Family had sadly decided to call it a day, and the next time I saw them was during their farewell tour, at Newcastle City Hall. The line up had changed (again) by the time of that gig, and the atmosphere in the City Hall was great, but tinged with sadness. Support came from Phillip Goodhand-Tait. Chapman was once again the focal point of the evening. I recall sensing as we walked out of the hall, that everyone was upset that they would not see this great band again. Family’s music was a strange and unique mix of rock, psychedelia and r&b. Singles such as The Weaver’s Answer, In My Own Time, and Burlesque were great favourites in the ballrooms of the time, the dancefloor always filling with lots of hippy dancers. Unlike many bands of that era, Family have never reformed; however Chappo continues to play (he has just announced a Christmas gig at the Y theatre is his hometown Leicester) and his set often includes several Family songs. Its a few year since I’ve seen Roger in concert (will blog on recent gigs tomorrow), but recent reports suggest that his voice remains as strong as ever. Roger Chapman is often forgotten these days. In my eyes he is a major figure in English rock music and has one of the most unique rock voices. Back in the early 70s, if you asked anyone in the North East their favourite live band, my guess is that they would choose a band who regularly played in local ballrooms and put on a great live show. In Sunderland the answer would have been Free, Family, and possibly Stray or Edgar Broughton. I saw Family a couple of times in the early days, and I’ll blog on that in a day or so. By the mid 70s Family were no more, and Roger Chapman was fronting Streetwalkers, along with Family compatriot Charlie Whitney. I saw Streetwalkers a few times: once at the very rainy Buxton 74 Festival, again at Reading 74, supporting The Who at Charlton in 1976, and at this gig at the City Hall in 1977. The Buxton gig was particularly memorable for one thing. Rain poured down the whole weekend, but when Chapman and Whitney sang Family’s My Friend the Sun, the sun came peeping out through the clouds, as if by magic, to a great roar from the festival crowd. It was a moment that anyone who was there will remember. I was there with my mate Gillie, and John was there with Susan; we were just talking about that special moment the other week. I also went to this Newcastle gig with Marie. I remember the City Hall being about half full; I guess by that point in time Chappo and his Streetwalkers were beginning to go out of fashion, particularly with punk coming along. The Streetwalkers always delivered a great set of rock with Chapman’s voice and stage presence being like no other. He would talk the crowd as if he knew them, and perhaps in some cases, he did. By 1977 the set featured tracks from their 1970s lps, with one or two Family songs thrown in for good measure. There was then a big gap, where I didn’t see Roger Chapman at all, which was a mistake on my part. I’ll report on some more recent gigs, however, in the next day or so.